Take Questions As You Go. Allow questions to percolate from the audience at any time. Stop Periodically and Ask For Questions. For example, stop for questions after each panelist presentation, key topical discussion or stop every 20 minutes to take questions. Dedicate a time for Q&A. Create a specific time to take questions from the audience, usually held at the end of the program and before the final summary. Queue. Questioners line up at the microphone. Runners. With a cordless microphone, the support staff runs to questioners who have their hands raised in anticipation. Oprah-Style. The moderator roams the audience with a cordless microphone to take questions. Question Cards. You can choose to pass out pre-printed question forms or note cards to the audience or have one placed on each chair as they enter the room. 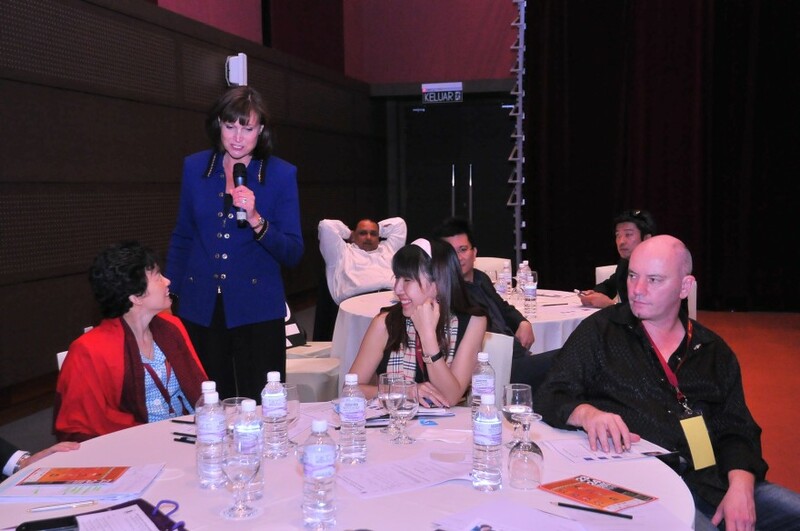 At a specific time in the session, the support staff circulates through the audience and collects the questions. You or one of your staff quickly sorts through the cards, selecting those that encapsulate key themes or ask an intriguing question. You can also have an audience member or panelist pull out a question card at random. Text or Tweet. Invite the audience to text or tweet (or some other social media platform) with the appropriate hashtag or cell phone number. Watch the feed while the panel is going on, check the feed periodically, or ask support staff to watch the feed for you. Small Groups. Break into small groups of three or four to discuss what questions they would like to ask. Pick random tables to ask their best question. Seeded. Ask trusted audience members to ask a straightforward or supplied question at the beginning of the session or during a lull in the conversation. Crowdsourced. This option requires a bit of technology to enable to audience to create and “like” the questions so you simply pull the favorites from the top of the list! My favorite tool is sli.do (which is free for up to 1,000 participants as long as you don’t care about branding or security) or PigeonHoleLive (which has more functionality yet is much more expensive). Both of these are web-based tools so anyone in the audience on a smartphone or tablet can add a question and the best questions rise to the top. You’ll need to have your smartphone or tablet close by or project the results in order to see the crowdsourced questions. Or, with sli.do, you can be really cool and check out the questions using Google Glass! Desktop icon for EventCX available!